Sequence alignment is one of the most popular application areas in bioinformatics. Nowadays, the exponential growth of biological sequence data becomes a severe problem if processed on standard general purpose PCs. Tackling this problem with large computing clusters is a widely accepted solution, although acquaintance and maintenance as well as space and energy requirements introduce significant costs. 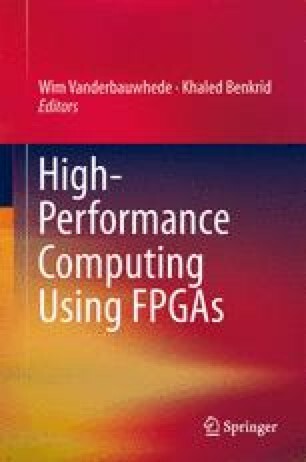 However, this chapter shows that this problem can be addressed by harnessing the high-performance computing platform RIVYERA, based on reconfigurable hardware (in particular FPGAs). The implementations of three examples of widely used applications in this area in bioinformatics are described: optimal sequence alignment with the Needleman–Wunsch and Smith–Waterman algorithm, protein database search with BLASTp, and short-read sequence alignment with a BWA-like algorithm. The results show a clear outperformance of standard PCs and GPU systems as well as energy savings of more than 90% compared to PC clusters, combined with the space requirements for one RIVYERA of only 3U–4U in a standard server rack.